Bradley’s Fern Park Restaurant in Muncy PA is closed on Mondays. But that didn’t stop a three-alarm blaze from destroying this eatery on Monday, February 17. Though the cause of the fire is unknown, neighbors on the scene did report that the heaviest part of the fire appeared to be coming from the kitchen. The blaze was first noticed by a motorist who happened to see sparks flying off the roof of the restaurant while driving past on the Susquehanna Trail. Firefighters from three counties were called to the rural restaurant, where they began trucking water from a nearby pond into order to fight the flames. It took over an hour to extinguish the fire, which ripped through the first and second floors of the building. One firefighter was reportedly treated for an unspecified injury, perhaps as a result of his or her efforts. The moral of the story here for owners of commercial kitchens is that a kitchen fire can occur at any time, even when the kitchen is not open. While we do not know what caused the fire in this case, if it did in fact originate in the kitchen it could perhaps have been prevented by an automatic fire suppression system, which would have kicked on when temperatures inside the kitchen exhaust hoods rose to unacceptable levels due to the fire. 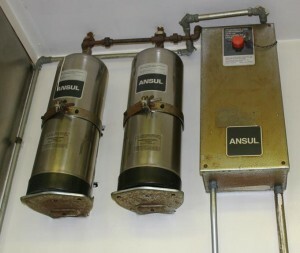 Can You Count on Your Automatic Fire Suppression System? A kitchen grease fire can happen fast, spreading deep into the exhaust system and potentially causing thousands of dollars in damages before your employees have time to react. That’s just one reason that a functioning automatic fire suppression system is so vital for any commercial kitchen. Another reason is that they are required by law in California. Do you want to risk a fire in your business or a citation from the city just because you neglected your automatic fire suppression system? Of course not. That’s why you’re going to call Flue Steam to handle all your kitchen air control and fire prevention needs. We can provide all the necessary services for keeping your kitchen code-compliant and your workers and guests safe, including automatic fire suppression system installation, testing, resetting, and inspections. We can also provide and service hand held fire extinguishers as an additional line of defense for small fires. Call us today to learn more about our fire prevention services.